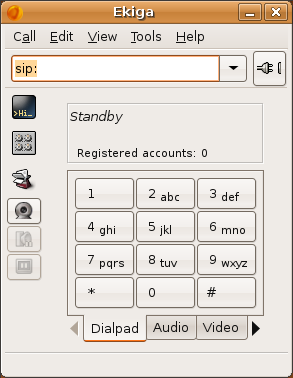 Ekiga is an open source sofphone for the Linux, and other similar, operating systems. 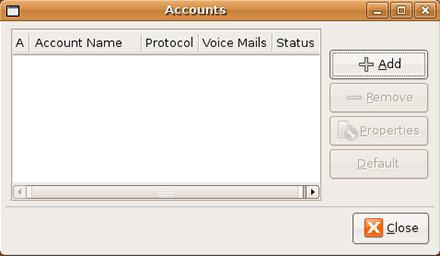 Originally known as GnomeMeeting this software offers the user a simple, easy to use interface with many features already built in. 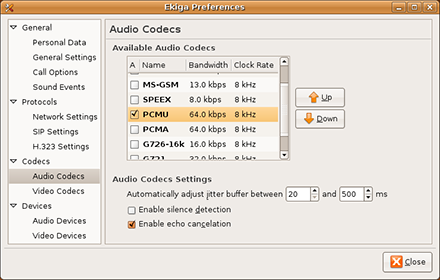 The setup information below is based on Ekiga version 2.0.12 running on Ubuntu 8.04 (x86) Hardy Heron; although most other older and newer version should look very similar. DISCLAIMER: We do not provide installation instructions for this software and assume that you have already installed it on your OS. If you require further installation instructions please visit the Ekiga homepage. Please open the Ekiga application. Once the application has launched you should see a screen similar to the one below. From menu bar click on Edit and click on Accounts. The following screen should appear. 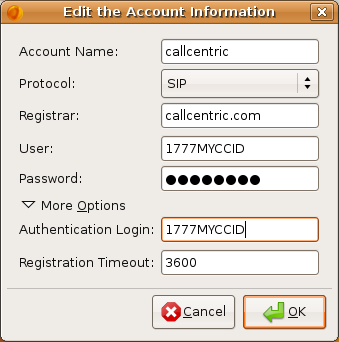 Authentication Login: This is either the default extension 1777MYCCID OR 1777MYCCIDEXT, where 1777MYCCID is the 1777 number assigned to you by Callcentric and EXT is the three digit extension you are trying to register this UA to. Click on OK to save your settings, you will be taken back to the Accounts screen. Now click on the Close button to go back to the main interface. In this step we will configure the outbound proxy, DTMF and codec settings. From menu bar, click on Edit and select Preferences. 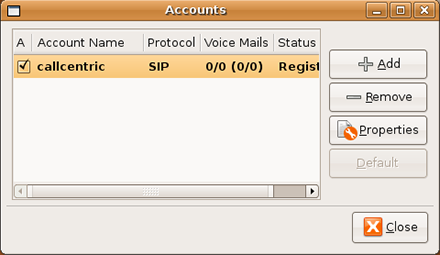 From there, please navigate to Protocols and click on SIP Settings. Click on Close to go back to the main interface.